Yuna "Let Love Come Through"
Fans are sure to get a stellar performance when attending an exhilarating concert by Yuna. Over the years, the Malaysia raised songstress has come to gain an international audience. Yuna has been praised internationally by many media outlets for her talents and ingenuity while also recognized for her amazing soft vocals and acoustic guitar that she plays. I was granted the opportunity to interview Yuna, who is an amazing singer and writer. Recently she released her 2nd EP, Sixth Street, which is very original, overflowing with creativity. “It’s really special to me because I was really involved with the making of this EP. I’m more in touch with myself. 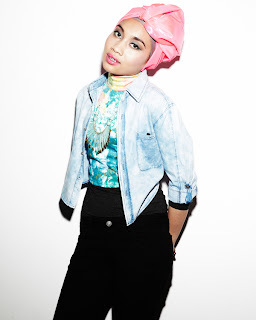 When I wrote all of the songs on the EP I was in my apartment on Sixth Street in downtown,” articulately says Yuna. While living in L.A., Yuna teamed up with Idolator.com to premier the song “Let Love Come Through” featuring Kyle. “Let Love Come Through” was the second song that was released from her EP Sixth Streeton Verve Records, which is special and dear to her heart. “I made this song with Chris Braide. It was something really different than what we use to do. I love writing with him. ‘Let Love Come Through’ is special. In the beginning [it was] like nobody got the song...not to say they don’t like it, but like they couldn’t rate it like we did. Now the song has a second chance. It’s on the EP. It’s so lively. It’s so cool. I love it,” states Yuna, who has had multiple songs featured in movies and on soundtracks such as “Shine Your Way” with Adam Young of Owl City that is featured on the animated film, The Croods. Being from Malaysia, Yuna has gained an international fan base as she continues to express her creativeness as an artist while singing songs about love and life. “I always see myself as a new artist. It doesn’t matter who I am and where I’m from. Every artist, every musician, every singer goes through the same thing…trying to get a fresh start. My fan base in Malaysia is huge, but it’s a whole different thing that I’m trying to do out here. I have to say, I kind of like the struggle. I don’t see things as physical or like a setback. Every day is a new thing; every day I set new goals to achieve. It’s really refreshing to be able to come out here and try to win hearts all over again. And I don’t mind doing that. It’s a lot of fun. And in the process of doing that you have to make great music,” says Yuna. During the year 2009, Yuna single “Deeper Conversation” won the AIM Awards for the Best English Song. She also released the self-titled album, Yuna, which featured “Live Your Life”, produced by Pharrell Williams. Yuna taught herself how to play the guitar at an early age. As of today, she has appeared on shows such as The Tonight Show with Jay Leno, CBS This Morning, along with many other national and notable shows. Outside of music she co-owns a women’s clothes boutique shop in Malaysia that has been established for 3 years. “I’ve always been interested in fashion. When you’re an artist, you’re surrounded by fashion. I had a ton of clothes. It all started out when I started selling my clothes online. My cousin and I talked about starting a boutique because a lot of fans will come up to me and ask me, ‘Hey Yuna, where did you get them jeans; where did you get those jeans, that kind of scarf?’ So I decide that it would be cool to have my own little closet and get stuff from there,” expresses Yuna who talks excited about the inspiration and innovation regarding her clothes boutique. She looks for the business to expand online where it can be visited atshop.iamjetfuel.com.